August has arrived, which means it is the final month of the Spectacular Summer Blog Hop. It’s been great sharing the inspiring projects of my fellow bloggers, and today is another great post! 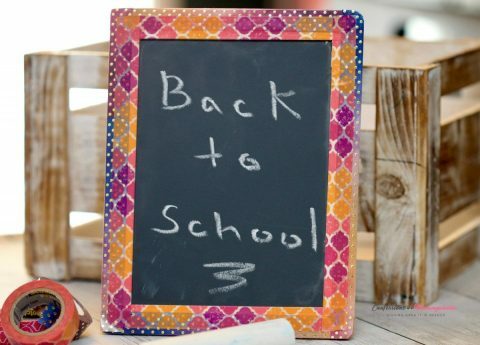 Confessions of a Mommyaholic has a quick and simple back-to-school chalkboard craft for you to make. This DIY washi-tape chalkboard would be a charming addition to back-to-school (or in our case, first-day-of-daycare) photos and could be used for special milestone pictures throughout the year. It’s great to take a nice photo on the first day, but there are also those brough-home-a-certificate or played-your-first-band-concert moments that deserve to be captured! Head over to Janine’s blog to see how to make it in time for the start of the school year! The Beatles! Seriously, they will always be the band to aspire to be. What would you do if you had an extra 30 minutes in a day? I would read, DVR catchup or just relax in all honesty. Catch up on all the #SpectacularSummerBlogHop posts here!